The thing to remember, however, is that no two sets of images will demand the exact same approach. In all retouching work, you need to dive into an edit with an approach, not a linear set of step-by-step bullet points, and be able to remain flexible and adaptive. After all, every shot is different and every new shot will throw a curveball at you that the previous one didn't. That said, when I see a situation in a shot that lends itself to enhancing some truly glorious deep skin tones, I run with my favorite process to get things started. 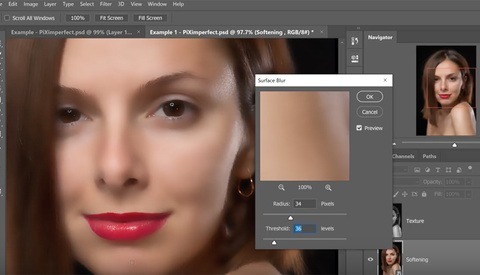 Also keep in mind, a lot of your searching for the perfect skin tone starts in raw processing, and quite frankly, you should strongly consider using Capture One Pro. As you can see in the before and after images, this Action gets you started on deepening your skin tones so you can then continue in your workflow with a great start towards achieving a darker, rich look to skin. Once in Photoshop, and whether your subject has very dark skin, medium dark skin, or simply a summer tan on fair skin, how you go about deepening the tone is crucial. The first thing that goes wrong, and often does, is accidentally oversaturating the skin color with sloppy darkening techniques. The second thing to go wrong is simply darkening skin tone too far. The proper technical approach and appropriate vision for what looks tasteful and balanced are what will get you that perfect, deep skin tone you've been after. I decided to make a Photoshop Action that does the first two steps I tend to begin with. You can download this Action totally for free from my website, right now. Watch the video tutorial above to see how I use it, and I would love to hear what you think of it. Just looks like a basic S-Curve to me. Mainly because the hair and the outfit were affected, and the outfit looks worse IMO. That’s where masking comes into play. It takes a simple click to use the free action he’s supplying and then you can brush what you don’t want affected. I try to be as realistic as possible about my Actions. Showing some "ideal" shot where an Action works seamlessly and perfectly is fine, but I prefer to show a more real world example where the Action does what it should do, but you then have to make a decision on the result and tweak accordingly. Is it ok as is? Do I need to mask something out? Do I need to reduce the opacity of a layer? Etc etc. The methods this Action uses are quick, smooth and reliable in terms of darkening almost all skin tones without oversaturating color, but are not the only ways to go about this process. A Curves layer on luminosity blending mode, complete with a solid masking job, would do it well, too.